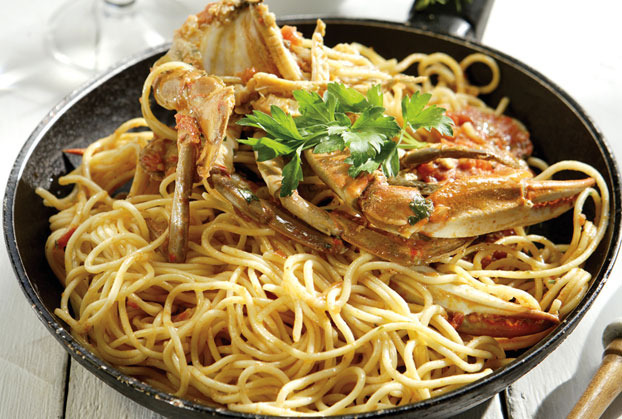 Warm the garlic oil in a large and deep pan, chop the crabs with a cleaver in two and stir-fry them in the shell for 3 minutes. Pour the ouzo in, wait until it evaporates and transfer the crabs to a platter. Put the chopped tomatoes back in the pan, bring them to a boil and then add the sugar, chilli pepper, salt and cook for 5-6 minutes. In the meantime boil and drain the spaghetti and add them to the pan with the tomato sauce. Finally add the crabs, mix everything gently, leave for 2 minutes and serve sprinkled with parsley.